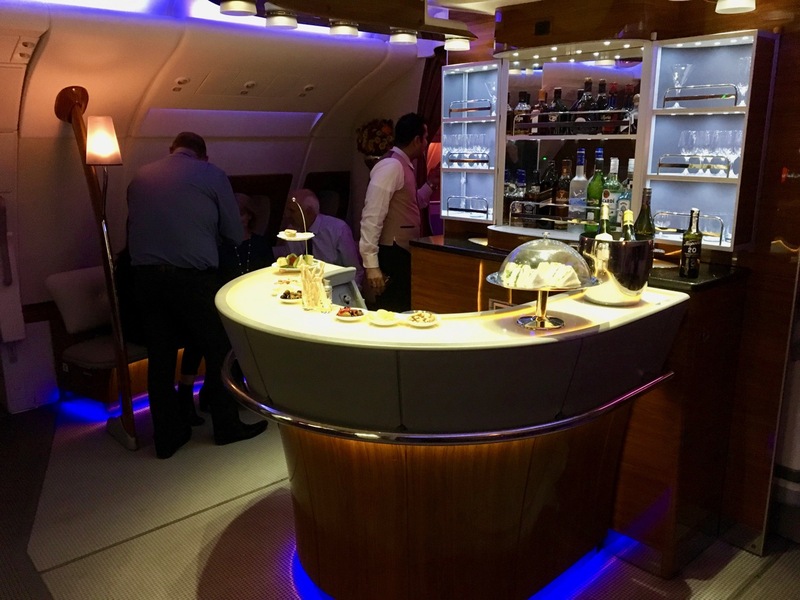 Amongst frequent flyers between Australia and New Zealand, it’s well known that Emirates A380 flights are the ones to aim for if you’re looking for comfort, service and amenities, whilst earning or redeeming Qantas Points. 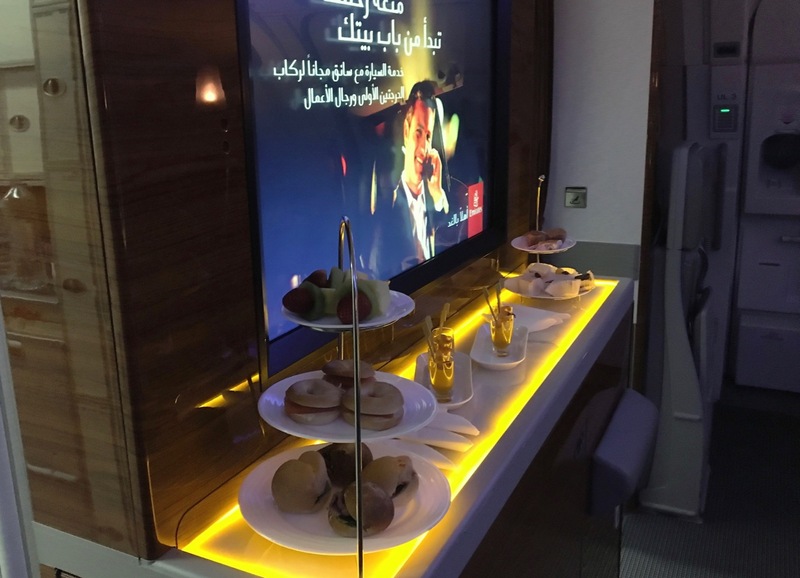 With Emirates now upgrading all of their flights between the two countries to Airbus A380’s, their appeal to those using Qantas Points remains – for the same 36,000 Qantas Points as you’d pay to sit in Business Class on a small Qantas 737, instead you can enjoy lie-flat comfort and the famous on-board bar – this is one of the funnest uses of a smaller Qantas Point balance out there, in my book. 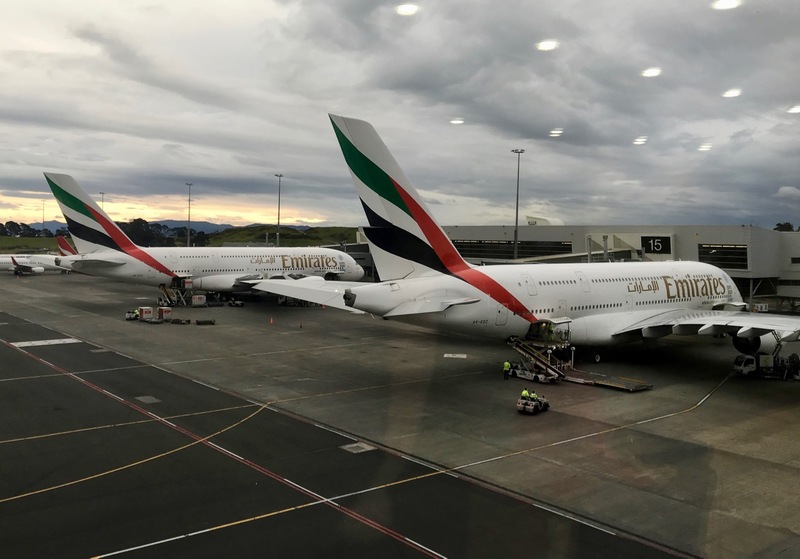 In this guide we look at the various flights that Emirates offer between Australia and New Zealand, how much they cost for a Business Class redemption, and any drawbacks of choosing to use your Qantas Points for Emirates First or Business Class. 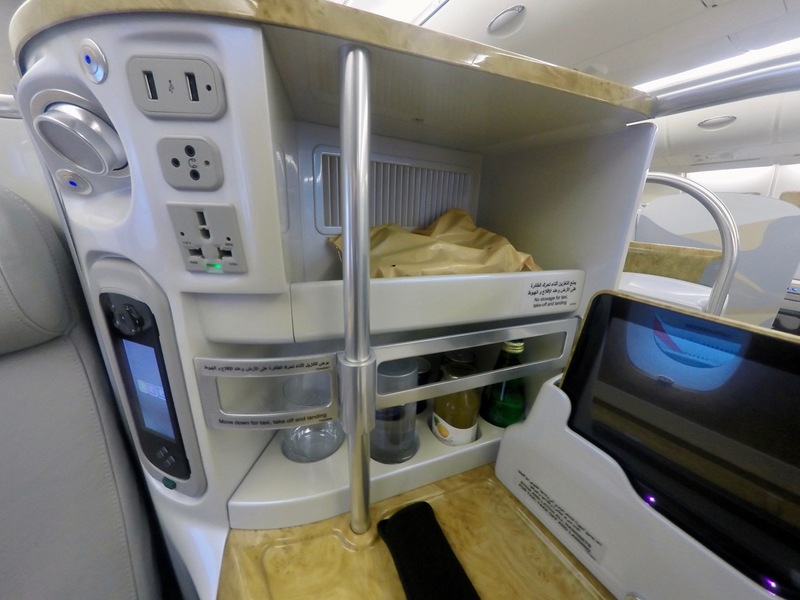 The size of Emirates A380 fleet is astonishing. 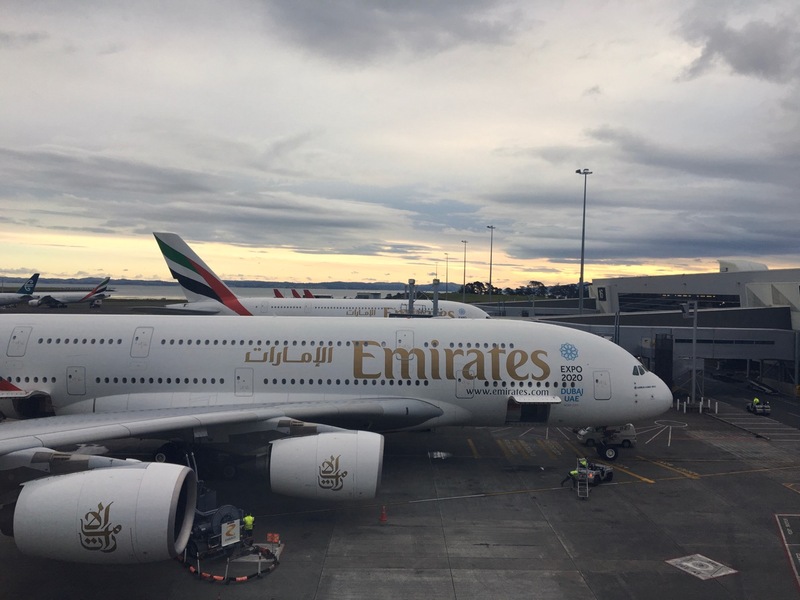 As the largest operator of the A380 globally, they have over 90 in service at the time of writing, including one flying between Sydney and Christchurch. 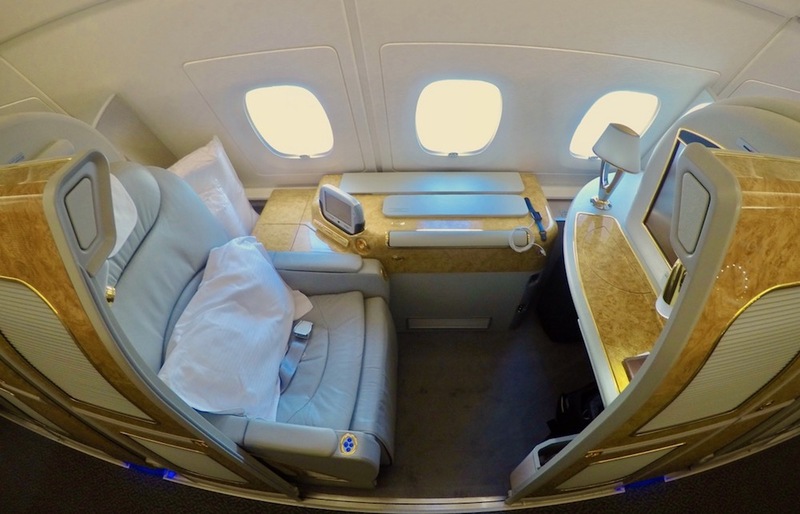 Emirates A380 Business Class is vast – and this massive amount of space is one of the main reasons to choose Emirates to fly between Australia and NZ. 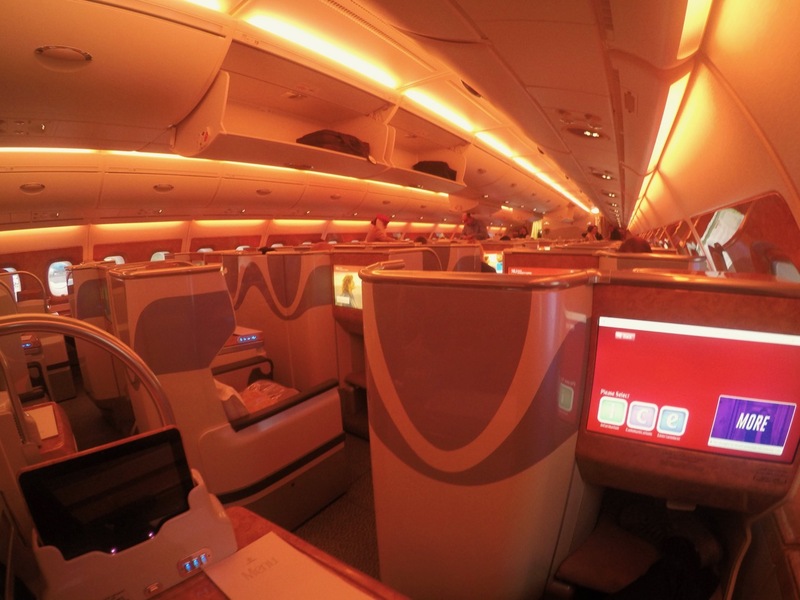 The cabin features a number of different lighting effects for long-haul travellers thrown out of their usual timezones. 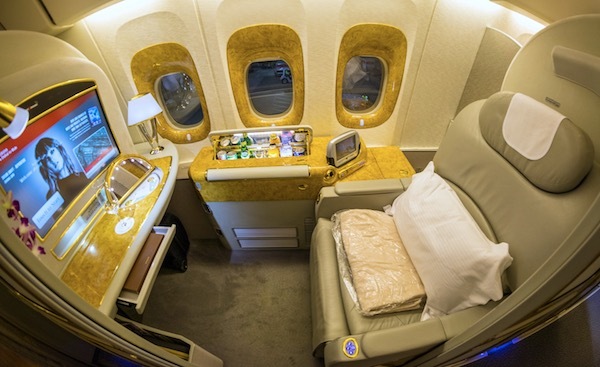 The Emirates Business Class seat on the A380 is a private, suite-like affair that reclines to a full lie-flat bed – not that you really need it if you’re just in the air for three hours during the day. 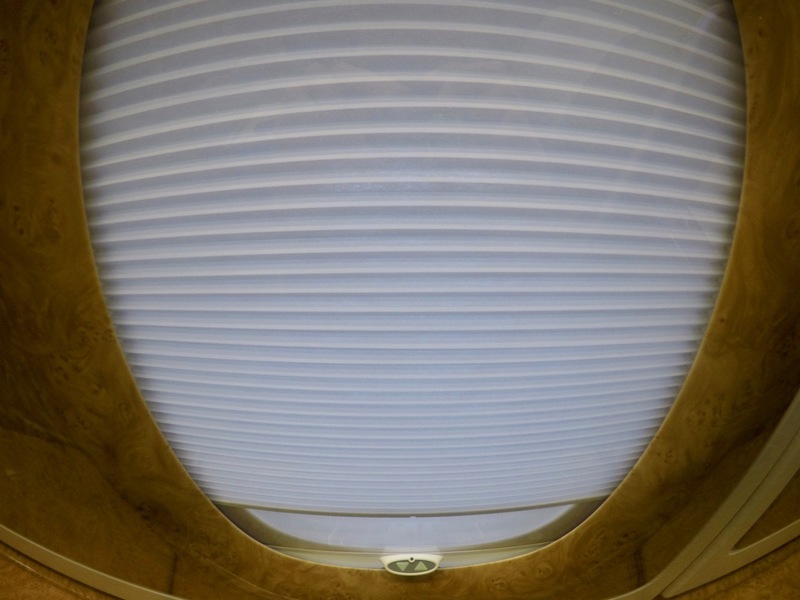 You’ll find several large windows at each seat, with internal blinds that you can open or close at the push of a button. 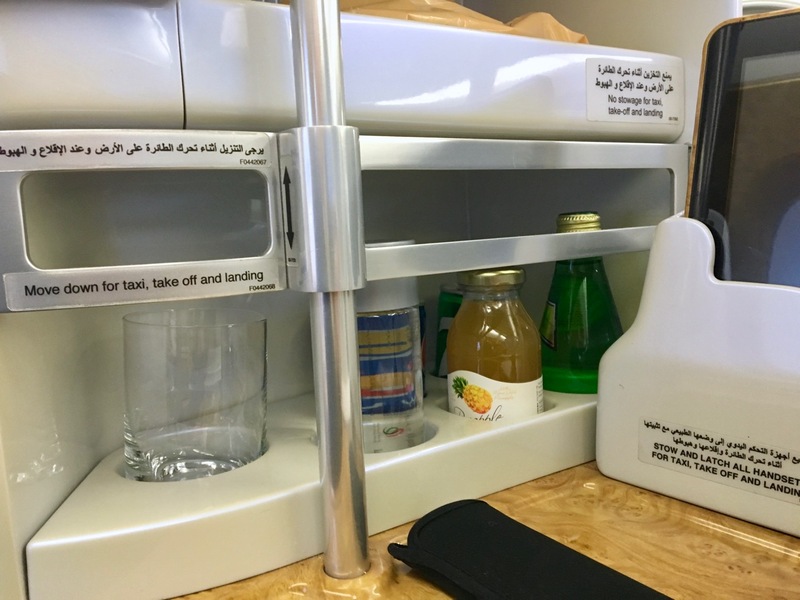 At each seat is a small selection of drinks from which you can help yourself – and of course there’s much more available on request, or from the bar at the back of the cabin. 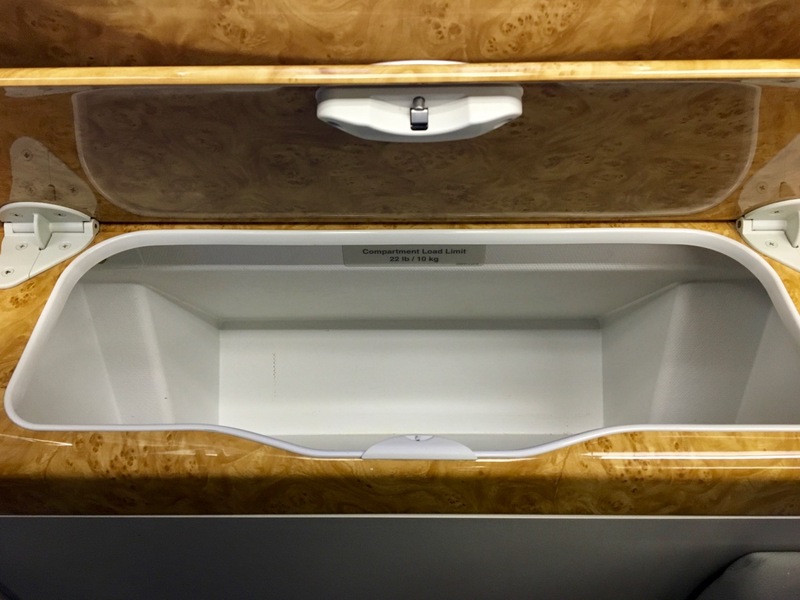 If you choose a window seat, instead of a pair in the middle, there are large storage bins for you to throw your belongings in and keep them at hand during the flight. 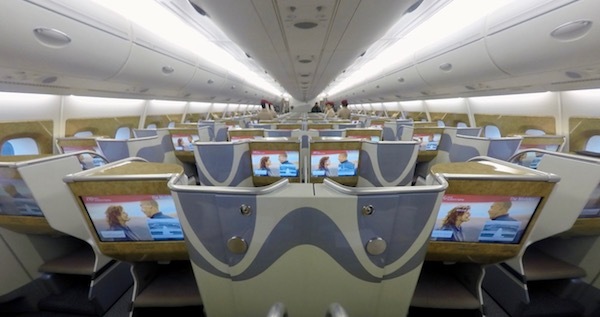 The Emirates ‘ice’ inflight entertainment system offers a large 20″ screen with a linked controller next to your seat. Both offer touch-screen browsing of the massive selection of movies, TV and the like. 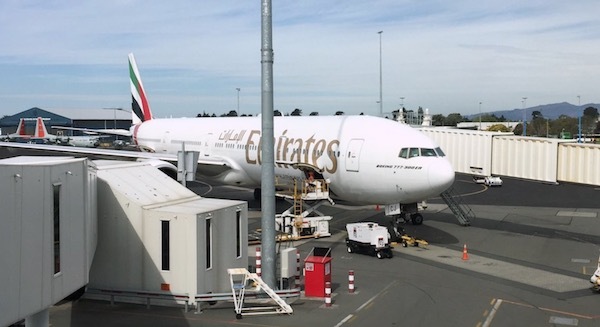 Remember that this is the same selection as what’s on offer for travellers heading all over the planet, so you’ll find plenty more options here than most of Emirates competitors flying between Australia and New Zealand. 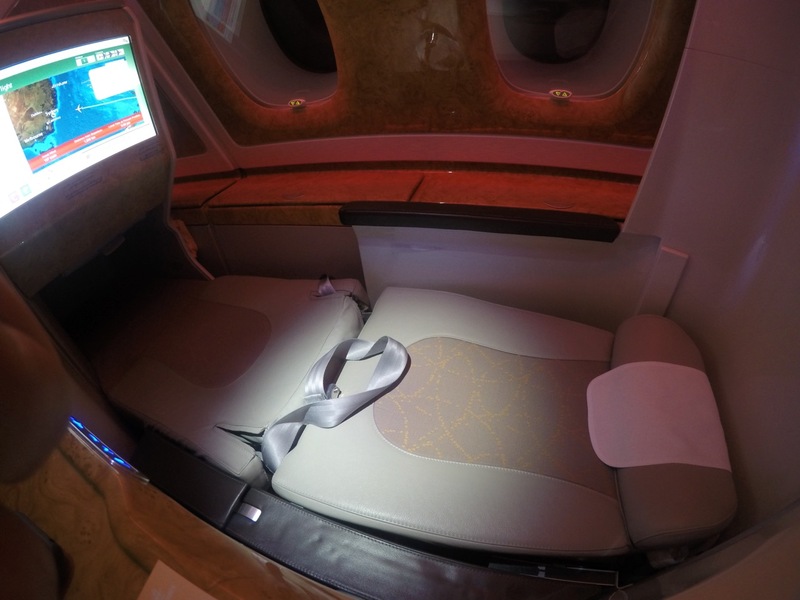 For solo travellers, the seats alongside the windows are definitely the pick. 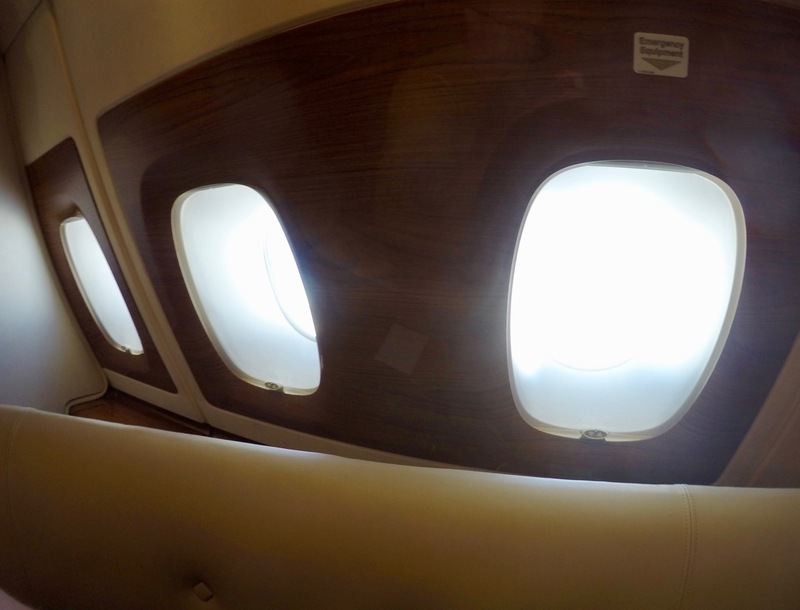 The cabin is configured with one seat along each window and two in the middle. Each single and pair of seats is staggered, so that some solo seats are right next to the aisle, while others are jammed up against the window – and those are the ones to aim for maximum privacy. For travellers in pairs or groups, the middle seats would be more desirable if you would like to socialise. Middle seats alternate from being positioned immediately next to each other and away from the aisle, or separated but next to the aisle. 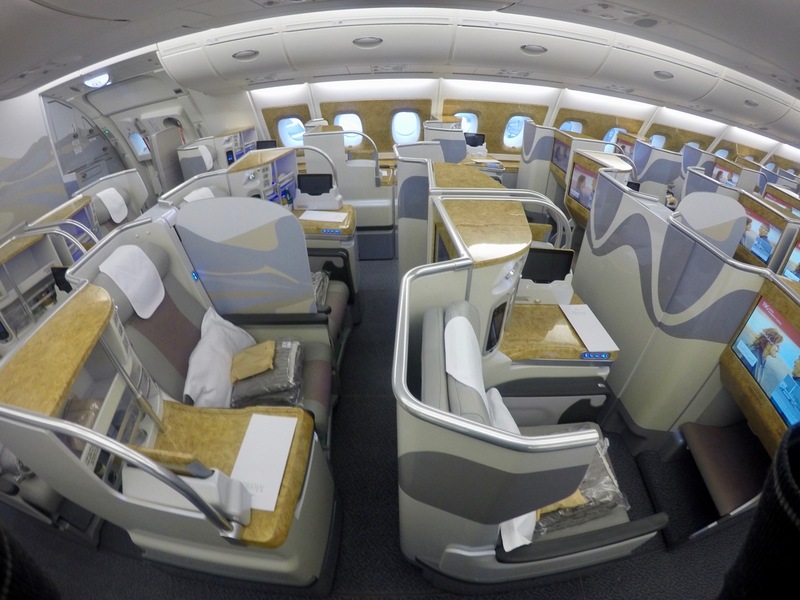 There are two cabins of Business Class seats, with a smaller one immediately behind the main cabin. The smaller rear cabin is backed onto by the bar. 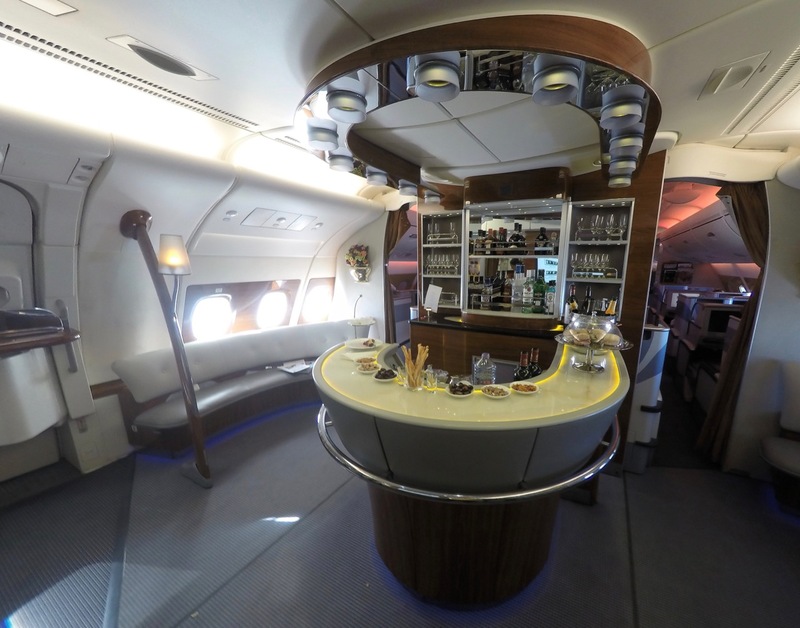 There’s no terrible seat, but I would pick one in the main cabin immediately next to a window as a solo traveller, and avoid the rear cabin which has more foot traffic and noise thanks to the bar behind. With such a large cabin – 76 Business Class seats – you’ll find the staff offer functional and efficient, rather than personal, service. You’ll get a pick of a main meal, plus any number of small to medium-sized snack meals from the on-board menu, and you can always head to the bar for more if you’re peckish. There’s also an extensive wine, champagne and spirits list to work on if you’re so inclined. 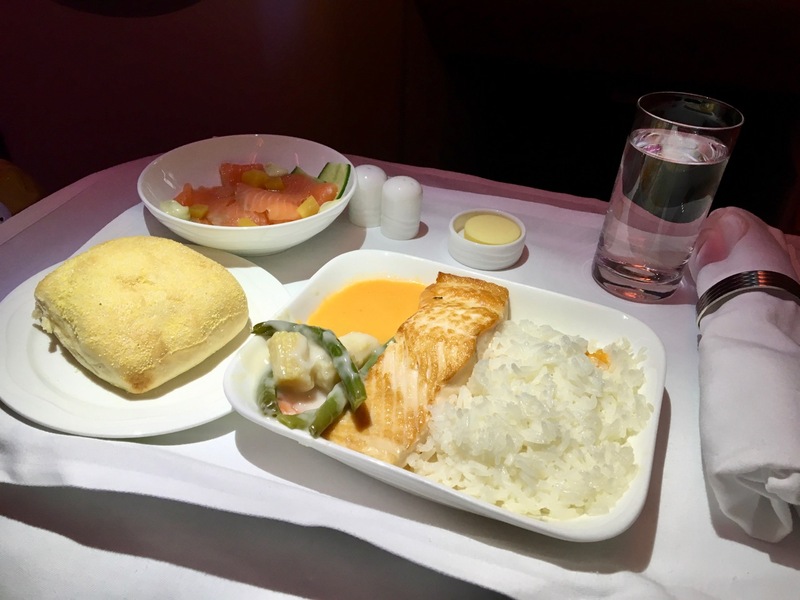 This is an example of a main course on an Auckland -> Sydney flight – pan-fried Salmon and rice, a choice of starter, bread and a dessert. 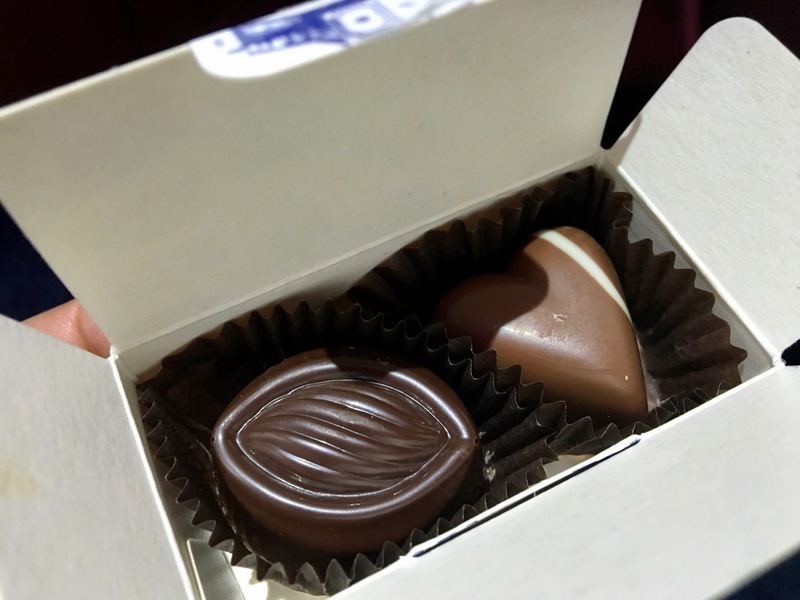 With a few Godiva chocolates to finish things off. The bar is well-stocked with sandwiches, savoury snacks and fruit – you can help yourself at any time. 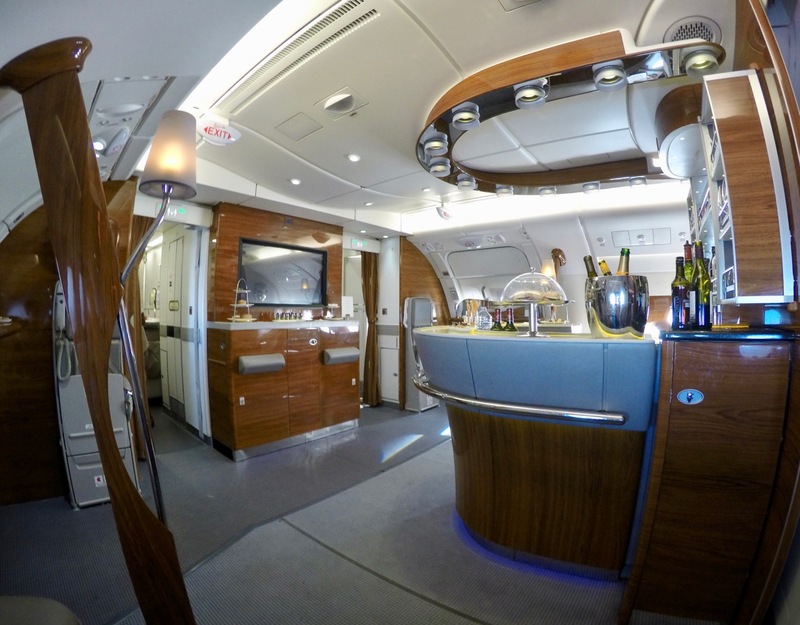 The bar can be used by Business or First Class passengers and is usually well-patronised. 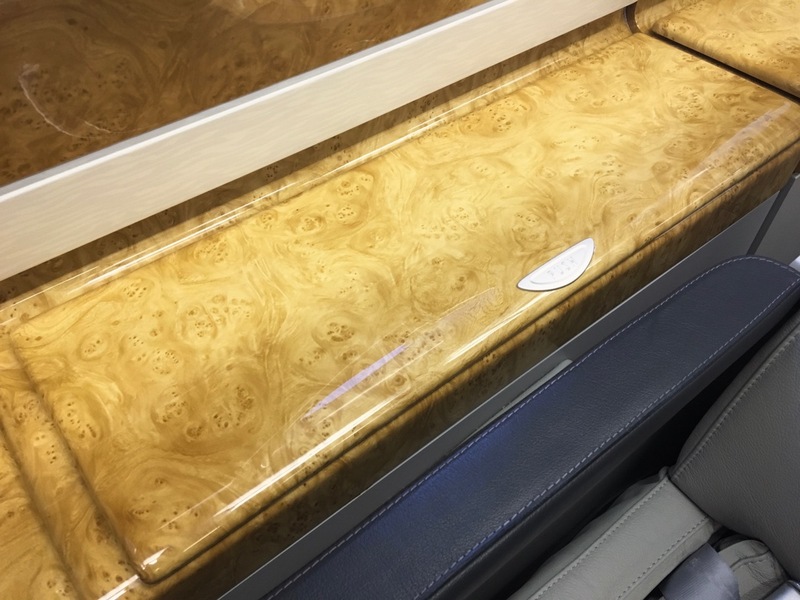 There are two large bench seats on either side which can comfortably seat 4, and a lot of standing space if you prefer to stretch your legs – getting the blood moving again is one of the best uses of the space in my opinion. 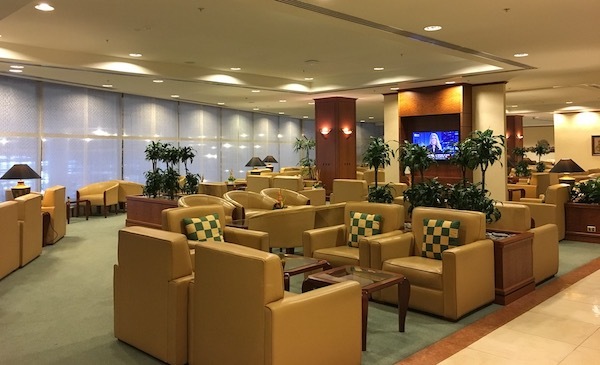 The bar seats offer a good view outside – it’s a great place to spend some time. I’d recommend taking a book or magazine with you if travelling alone so you have an excuse to park yourself for a little longer than it would take to otherwise just have a drink or snack. And once the flight is done, you’ll be offered Express Arrivals access in both Australia and New Zealand at the end of your trip. By collecting Qantas Points you get access to redeem them for one of the less ‘available’ redemptions out there – Emirates don’t partner with many frequent flyer programs and are not part of a formal alliance like oneworld, so Qantas Points are one of the key currencies with which you can book Emirates flights. We’ve rounded up some example points and taxes pricing, correct at the time of writing in February 2017. 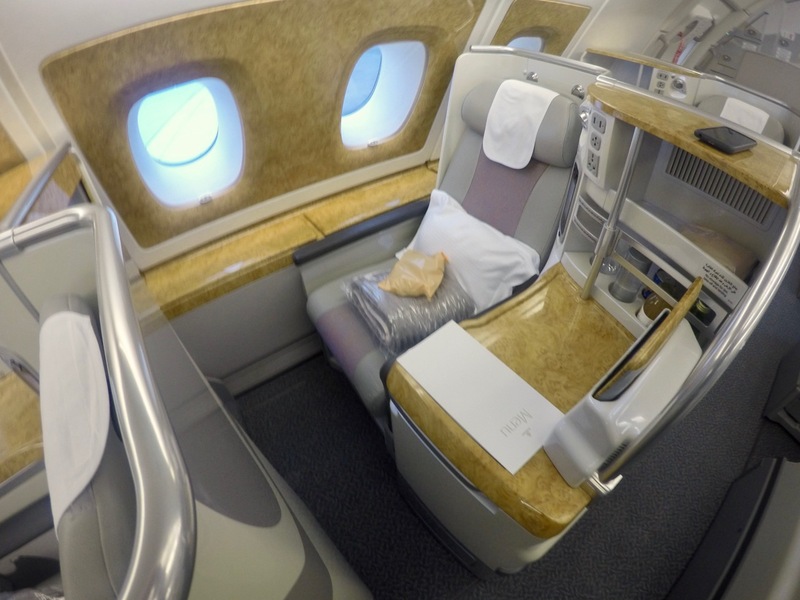 Emirates redemption availability between Australia and New Zealand in Business Class is generally fairly good, so with a little planning and maybe some date flexibility there is a good chance you should be able to secure award seats. Making the booking is simple – you can research availability and book directly on Qantas.com. We’ve written a full beginner’s guide on how to do this, linked below. If using cash, fares start from around $650 when on sale, which seems to come up for advance bookings every three months or so. 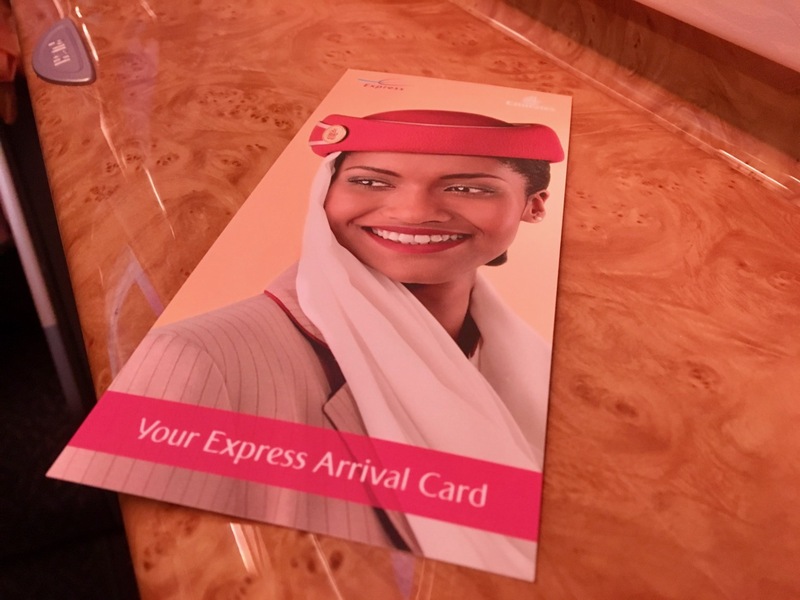 Be aware that when booking Emirates flights, if you care about earning status with Qantas then only bookings made with QF (Qantas) flight codes on your ticket will earn status credits. 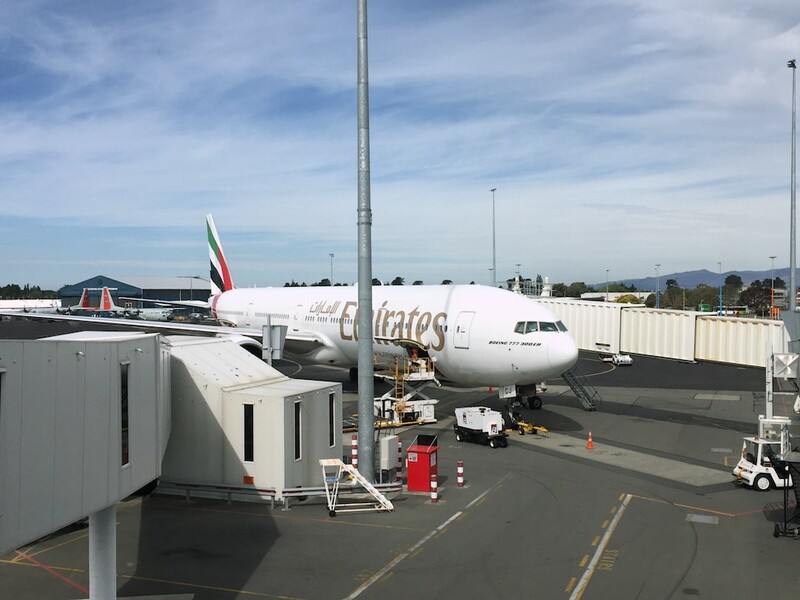 Some of our contributors have had the pleasure of enjoying Emirates service between New Zealand and Australia, including Clayton’s trip in 2016. 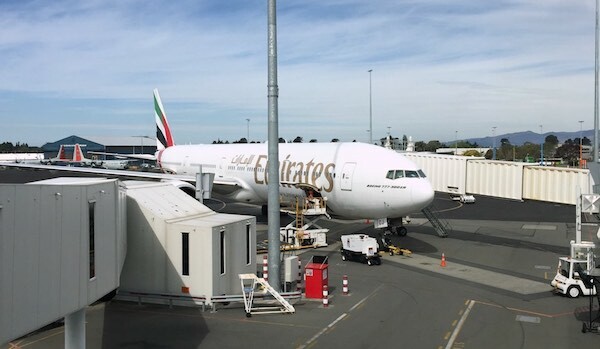 We’ve also previously reviewed Emirates’ (less good) 777-300ER service between Christchurch and Sydney, which was replaced by an A380 on the Christchurch route in October 2016. 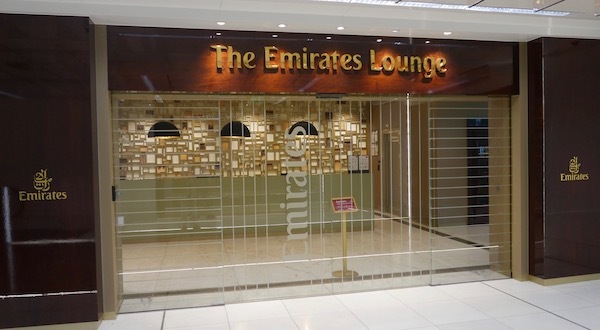 Available to anyone flying with Emirates in Business or First Class also are the Emirates lounges at your departure airport, which you will gain access to whether your ticket was booked using points or using cash. 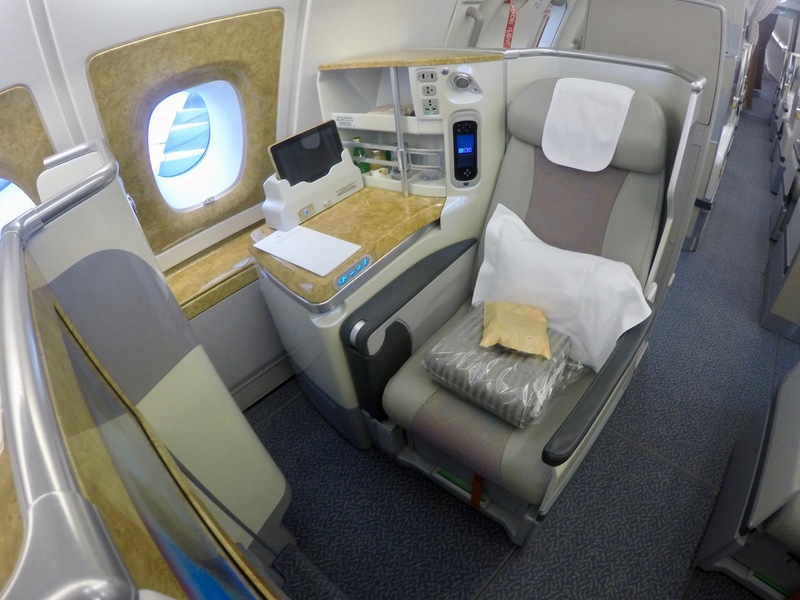 Summing up – Why choose this flight? 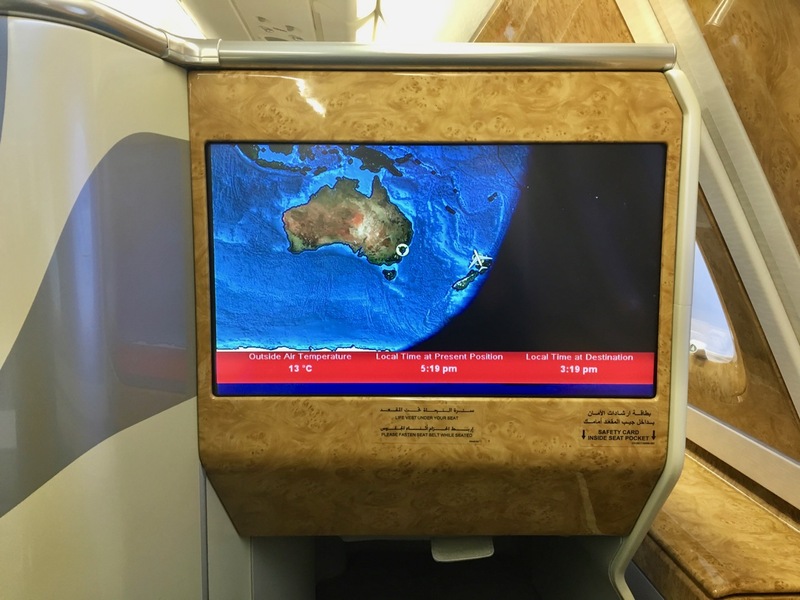 Emirates A380 service across the Tasman is a great use of Qantas Points, or cash if you can find a decent sale fare and justify the cost. 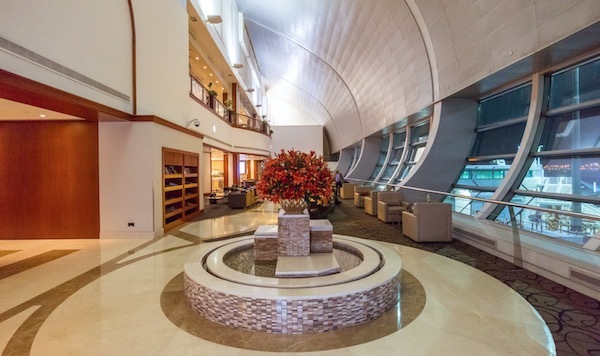 During a sale, a one way flight can usually be picked up for around $650 NZD or AUD one way. It works best for those who aren’t going to be completely put out if there is a slight delay – any issues with the incoming flight or while the plane is on the ground in Auckland could cause delays in either direction, and unless there are significant issues, it wouldn’t be easy to be rebooked on another service if you booked directly through Emirates. 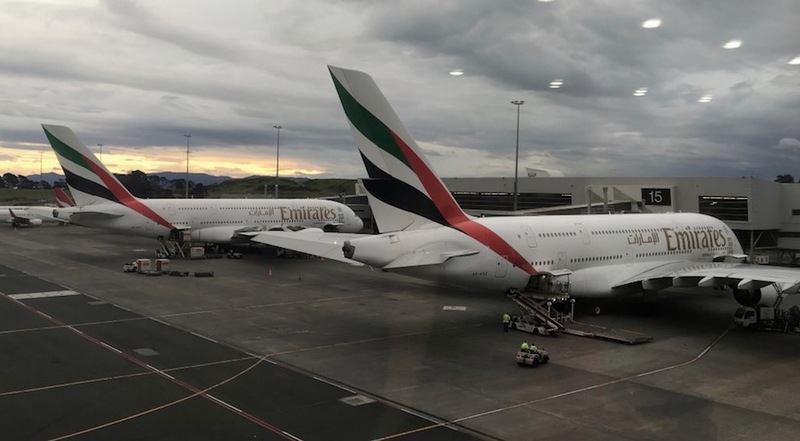 It also works well for those who are happy with the timings given there is only one daily flight on each of the routes between Australia and NZ – and who don’t mind a slightly longer flight, as it takes a little longer to board an A380 full of passengers than a small single-aisle 737. 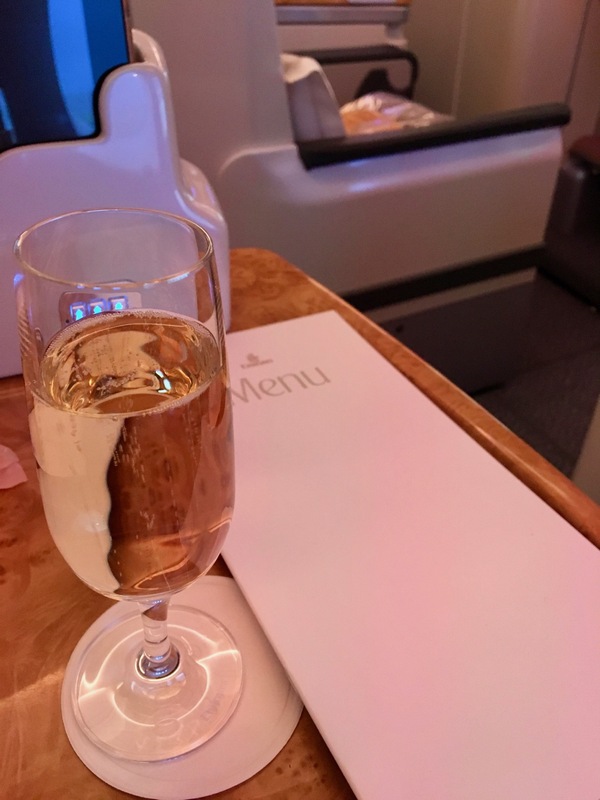 With all that said, Emirates Business Class becomes a great value way to start or end a trip to or from New Zealand and Australia, and from a relatively small balance of 36,000 Qantas Points, you can find yourself enjoying one of the best Business Class cabins in the sky. 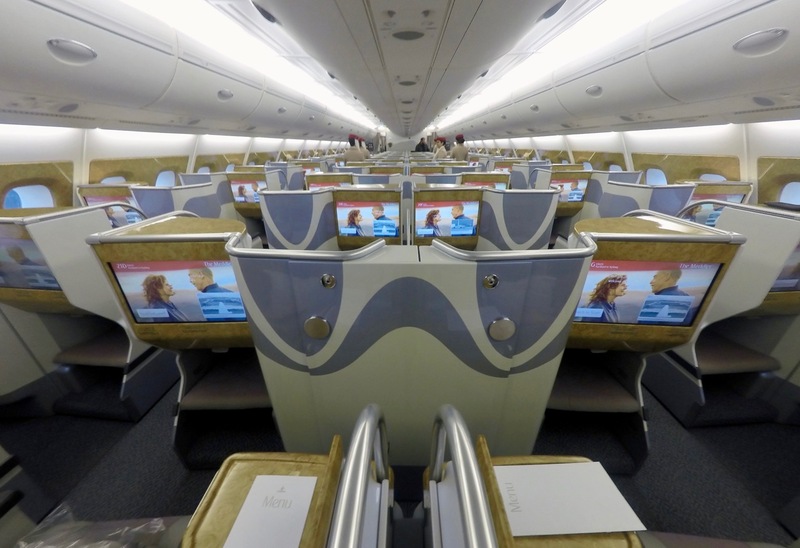 Do you know if the divider between the 2 middle seats immediately next to each other on the Emirates A380 can be lowered for a flight from Perth to Dubai/Barcelona? This is for a couple travelling together to save craned necks? Definitely better than a QF 737 however I just returned from SYD-AKL-SYD on QF and enjoyed the QF A330 with lie flat seats in both directions (QF145/146). 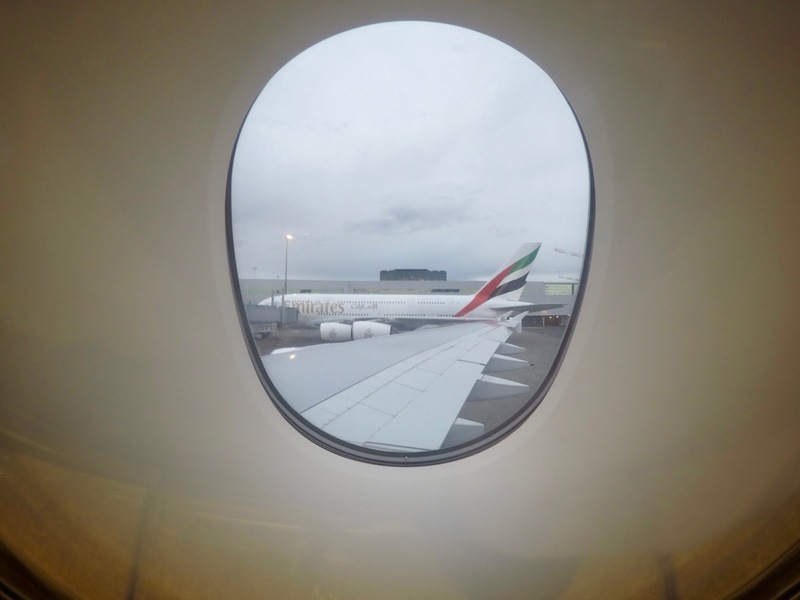 I have done the EK 380 many times across the Tasman, particularly as it is often the latest flight departure AKL-SYD. Just nice to change it up….